The artistic spirit can arise at unexpected times from unanticipated places. This is precisely the case with Shannon Gronowski. Though she has now experienced what it is like to create art in many of its forms, her transition from part time to full time artist came as something of a surprise. After discovering her creative passions while attending college for a medical degree, she has embraced life as an artist and has shared her various pieces with clients and admirers in a variety of places. Gronowski was born in North Dakota, where she met her husband of 33 years, Rob. The couple has two boys. The family moved to Idaho 26 years ago, and has lived in Eagle 25 years. Gronowski discovered her passion for art in college. She began school with the intent of pursuing a degree in the medical field. However, she ended up graduating with a Bachelor of Fine Arts. This isn’t the full extent of Gronowski’s experience. She has also taught private art classes and ran the Art Parent program at Eagle Hills Elementary. At one point, she even had a small studio in downtown Eagle. 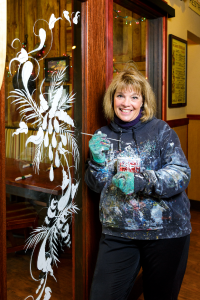 She’s painted everything from the windows of Doug’s Burger Den to the end zones at Eagle High School. It was a very poignant moment in her education. Her professor explained that the reason behind the destruction of these pieces was that he never wanted his students to think that they had achieved their best. “He wanted us to grow with everything we did,” said Gronowski. When asked what art means to her, she simply says “freedom.” This seems unusual, since much of her work is done for clients. “I do a lot of drawing and painting for customers, and someone else is usually picking my subject,” she explains. But in her own artistic pursuirs, she still has creative liberty with her subjects, which means that she can just be free with her imagination.